I took my philosophy of bringing in mentors and supporters to make this book idea a reality. There were several friends who helped me brainstorm, edit, reorganize and generally tell the story I wanted to share. There were many more people instrumental in supportive roles and I wish to thank all of my family and friends who contributed because they are part of my life. A book really is the sum of life experiences as much as it is about one specific topic so thank you to all of the people who have shared parts of my life, too. I was lucky enough to have my personal development coach, Marshall Sylver, write my foreword. 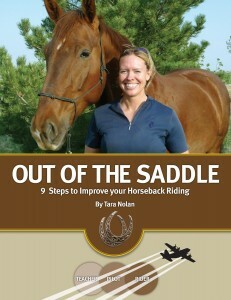 Camille Blakey, from Blakely and Company created this beautiful cover design to capture my unique perspective as a pilot and educator as it relates to horses. My brother, Michael Nolan, designed the graphics I use throughout the book to represent horses and flying. My foreword was written by my personal success coach and mentor, Marshall Sylver. He has guided me through some big shifts in my mental game and shared with me the power of NLP. 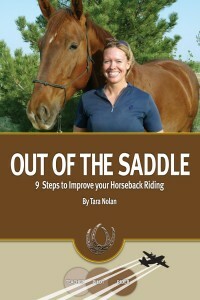 I wrote Out of the Saddle: 9 Steps to Improve Your Riding out of a sincere desire to help people put their desires and dreams of riding into a manageable blueprint or plan. I wanted to write an instructive and thought-provoking manual and workbook to help you pull your desires from inside your head and heart, and then to and create some doable steps to start on the path to personal success. In addition to dreaming, we all like to be grounded in reality— to feel the pleasure of accomplishment. In writing this I am sharing with you the clearest vision I have of the learning process. Of course, studying dressage and horses is a never-ending journey. As I learn more, this volume will be updated appropriately. I would be most delighted to hear from you to help guide these future editions. Share your success stories with me. Tell me what steps were particularly helpful, and give me feedback on how you put these ideas into action. Offer your suggestions for improvement. Let me know what still perplexes you. Although I cannot guarantee success, the principles offered here are tried and proven. They work for those who use them. I do extend this warning, however. Be careful…if you follow the guidelines set forth in this manual, you may outgrow the status of perpetual novice—just as I did. Best of luck. I delight in your achievements, so please send emails and video links to share your victories! Now get busy! !